The Trump administration was thrown into damage-control mode this week by a new book from veteran Washington journalist Bob Woodward, which depicts a dysfunctional White House and a president viewed by his inner circle as dangerously ignorant and impulsive. In the 448-page Fear—the result of hundreds of hours of interviews with current and former administration officials—Woodward describes “an administrative coup d’état,” with senior aides frequently defying President Trump’s commands. 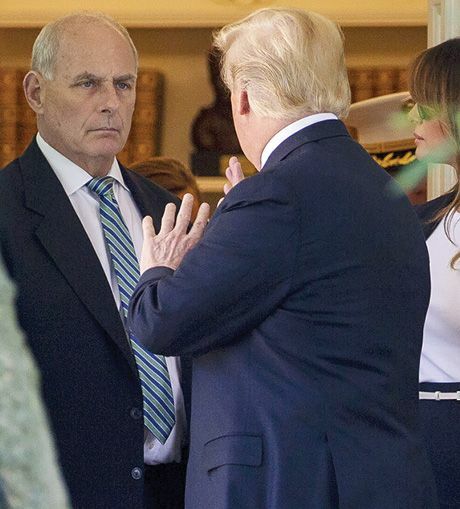 Woodward reports that White House Chief of Staff John Kelly told colleagues that his boss was “unhinged” and an “idiot,” while Defense Secretary James Mattis described Trump as having the understanding of “a fifth- or sixth-grader.” And Trump’s former personal lawyer John Dowd is quoted calling the president a “f---ing liar” who would end up in an “orange jumpsuit” if he testified to special counsel Robert Mueller. Close advisers also describe the apparent joy Trump takes in humiliating others. He reportedly called Attorney General Jeff Sessions “a dumb Southerner” and “mentally retarded,” and mocked his accent. White House press secretary Sarah Huckabee Sanders dismissed the book as “fabricated stories.” The president accused Woodward of using “made up” quotes, and suggested the reporter—who helped uncover the Watergate scandal that brought down President Nixon—might be “a Dem operative” seeking to damage Republicans before the November midterms. For someone who’s supposedly “out of his mind,” this president is remarkably successful, said James Freeman in WSJ.com. Under Trump, the economy is roaring and unemployment is plummeting. Look at the indicators: American factory activity in August climbed at its fastest pace in more than 14 years. Perhaps stimulating the economy “by reducing the burden of taxes and regulation is so simple that even an unhinged ignoramus can do it.” Or perhaps Trump “is not as crazy and ignorant as Woodward” would have us believe?